Preconceived ideas are a funny thing and they can get you going in the wrong direction at times. At least they do me. 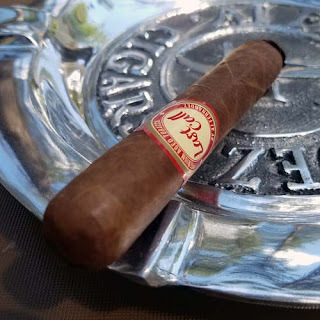 As an example, with flames on the lower band of this Romeo y Julieta Havoc Stocky Bully, I was expecting this cigar to be a full-blown fireball of a pepper-bomb. Wow, was I ever wrong. Starting with the construction, this cigar is top of the line. The oily Colorado Claro colored wrapper appears nearly seamless and vein free. It's packed quite firmly full length and good looking triple cap completes the package. From the cold foot the aroma reminds me of a sweet White Zinfandel wine. Nice! After clipping the cap the draw was a bit firm, yet free, and I could taste toasty, sweet, fermented tobacco. Once the Havoc was toasted and burning the first few puffs proved that my preconceptions of this cigar were wrong, dead wrong. The first mild bodied mouthfuls of smoke were a mix of toast, cream and mild white pepper. In fact there were toasty flavors of oak, tobacco, leather, cream and raw sugar full length. When the slightly wavy burn reached the top band area there was a quick dash of hot red pepper, but it disappeared as quickly as it arrived. The Havoc finished its sixty minute burn with a tasty, medium bodied mix of toast and sweet cream. Over the past year I've smoked quite a few Romeo y Julieta cigars and they have grown on me. I really like their quality of construction and flavors, but after smoking the Havoc, I have a new favorite RyJ. 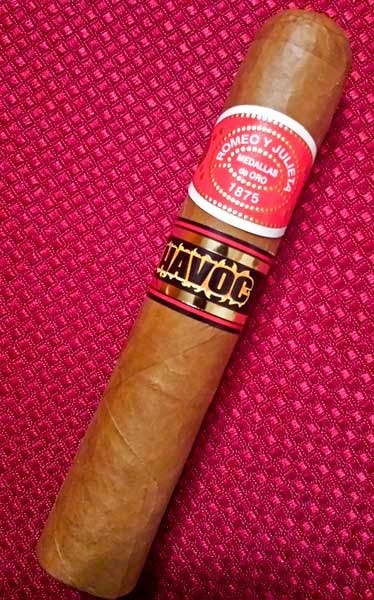 You can find the Romeo y Julieta Havoc Stocky Bully in packs of 5 at Famous-smoke.com for only $26.99. That's a deal on a really nice cigar!